A big thank-you to everyone over at Yahoo for featuring Cute with Chris on the front page today. If you're new to our cult show... welcome. Watch our special CHRISTMAS EPISODE, or perhaps subscribe thru iTunes. Drink the Kool-Aid, it's fine. i subscribed on itunes. Now where's my kool aid? Yay Chris!!! You're famous MyLord! Don't let this extra publicity get to your head! I think Donut is adorable and since she is a kitten, she has time on her paws to practice to become next top meowdel. If she had buttons of her cutest expression, I would purchase one. Tell the 16 year old to take photos and get buttons made. "Sleeping Kitten - Dancing Dog!" Plenty of French Pastry for you! Theres nothing like logging onto your homepage to find Chris's face featured right there in the middle. Xmas is truly a magical season. I'm new! And grateful to Yahoo for directing my attention to your hilarious cult/show. Nice response to your Christmas video critics. They need to stop drinking the hatorade. Drink the Kool-aid!!! LMFAO! I am in love with anyone who makes that joke. You know most people won't even get what that really means...and that is why it is even freakin' funnier! Congrats! Looks like you got kicked off to make room for a dead guy (Ike Turner). Geez, I didn't even know he was still alive. I just saw your videos through yahoo and watched about 20 more of them. You are a HOT MESS! Which can be a good thing, or a bad thing, but should be thought of as good in the context of this message. Well well well, Mr Big Stuff. We were followers before you were cool! Oh, alright. You were always cool. And I only subscribed to the Cute with Chris feed last month … so I’ve not been there since your first episode. I am sorry for this. Damn it. I wanted #1 fan bragging rights. I am new to the cult, thanks to the Yahoo front page placement. After seeing the cats duke it out for modeling supremacy, I sat back and watched as many of you brilliant videos as possible. I hope to someday send you a humorous picture of me and some animal... until then, I'll settle for being one more black (female) viewer on your roster! 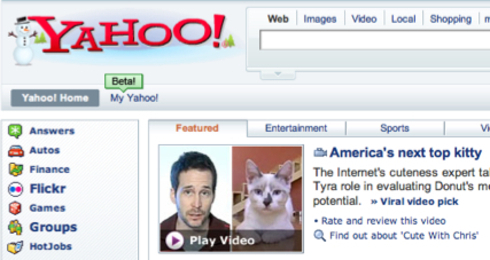 Yahoo is featuring your video with Donut the cat. Apparently when you said to put bleach on the Donut's face, a Yahoo reader took it seriously. Foolishness...by kilkennycat Whether you re joking or not, it s irresponsible to say use household bleach on any animal. YOU ARE SO CORRECT. I DID TRY IT, AS MY KAT HAD A LITTLE ORANGE SPOT AND IT JUST REMINDED ME OF RED-HEADED KIDS - SO UGLY. ANYWAYS, MY KAT RAN AROUND LIKE I HAD TAPED IT EYELIDS SHUT AGAIN. CRAZY. AND THE MEOWING...MY GOD! NOW THERE S THIS HUGE UGLY SCAR ON ITS FACE, JUST ABOVE THE EYES. ANYONE HAVE A SUGGESTION ON HOW I CAN GET THAT OFF? THANKS IN ADVANCE, /VR/ MAX CANNON." This gives me hope that I can control the world too. dude, just watched your christmas show again, and i just wanna say that your are totally brilliant!!!!! i have not laughed like that for a very long time!!!!!!!!!!! it kinda made me pee. just wanted to say something about that LOOSER who bleached his cat. how is chris responsible for that??? what ever happened to common sense??? Wait, that's kool-aid? I see now. It's just like the "cranberry juice" you like to drink. Oh.My.God! Read some of the comments left on yahoo- people are taking this seriously...like you've permanently damaged the kittens psyche! As for the comments about folks actually using bleach- please tell me no-one is that dumb! Perhaps this is a good time to say pass me the kool-aid Master! MyLord, your fame is going beyond imagination! Congratulations! All my dreams are alive! Yahoo did infact introduce me to your cult. Your Koolaid is delicious and your humor is infectious.